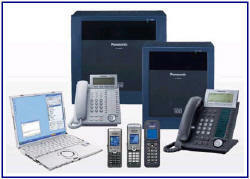 E System Sales, Inc provides three Panasonic Office Phones that connect to a System available for small to mid size business with the needs of less than 12 lines X 24 phones with all of the features like caller ID, call transfer, voicemail, call hold, music on hold, intercom, public address, don not disturb, speed dial, conference call, microphone mute, redial and more. The KX-TA824 Panasonic Office Phones connected to a system is an affordable phone system for small business that starts out at three lines in X eight phones with major expansion to eight lines in X 24 phones with cordless phones available. 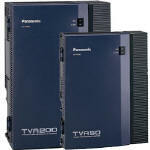 The Panasonic KX-TDE is a phone system that is available in 3 different sizes to meet the needs or medium to large systems of up to 1000 phones or more. The Panasonic KX-TDA50 is a more advanced digital phone system for small to mid size business phone system that starts out at an initial configuration of four lines in X eight digital phones with expansion to 12 lines in X 24 corded phones X 24 cordless phones. We have the latest model digital phone and IP phones available for all the digital phone systems starting with the KX-TDA.